Jerusalem Mayor Nir Barkat is inflating data about his administration’s investment in East Jerusalem schools, but statistics released by the municipality last week do not correspond with data recently given by various council departments to a local NGO, Haaretz reported Monday. According to the municipality, there will be 112 new classrooms in East Jerusalem elementary schools and 68 new secondary school classrooms. According to the report, however, there will be only 38 new classrooms in East Jerusalem, with another 44 rooms under construction and some 400 in the planning stages. The municipality also said there would be five new schools opening in the eastern area of the city. However, according to the report there will be just one new school, in Beit Safafa. The report further pointed out that over the past six years new classrooms in East Jerusalem have been built at a rate of only 36 per year. There will be 89,543 pupils studying in East Jerusalem this year, amounting to 36% of the total number of pupils in Occupied Jerusalem. However, there are over 22,000 children and teens not registered in any local school, public or private. At least some are presumed to be enrolled at schools outside Jerusalem city while a larger section dropped out of school. The Union of UNRWA Employees has declared the suspension of all protest steps and the resumption of work on Monday at all schools with 38 students in each classroom in order to give a chance for talks with the agency. Member of the union Wajdi Jawdeh stated in press remarks to the Palestinian Information Center (PIC) that the union held a meeting on Sunday with representatives of popular committees and families of students and agreed on freezing all protest steps until the UNRWA commissioner-general returns to Gaza on the ninth of September. Jawdeh added the attendees also agreed on retaining the old number of students in each classroom as a condition for the return of students to the schools. He warned that if the agency's commissioner-general did not approve the demands tabled by the union, the protest steps would resume. Students and teachers recently refrained from going to UNRWA schools in protest at overcrowding in their classrooms and the agency's decision to increase the number of students from 38 to 50. A generous pledge of US$15 million from the Government of Kuwait will help enable UNRWA to open its schools on time for the 2015/16 school year, UNRWA said in a statement issued Friday. UNRWA had been facing a budget deficit of US$101 million in its General Fund that risked delaying the school year for the Agency’s 685 schools, potentially affecting half a million Palestine refugee children in Gaza, the West Bank, Jordan, Syria and Lebanon, the statement reads. Kuwait has long been an important and consistent donor to UNRWA. So far in 2015, they have donated US$15 million for Palestine refugees affected by the conflict in Syria, in addition to their annual contribution of US$2 million to core activities in March, the statement added. 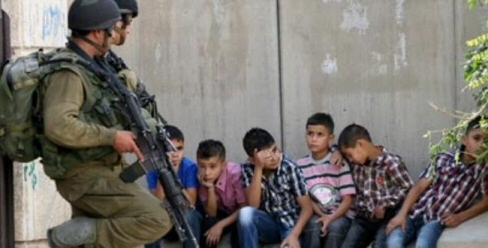 The Israeli Occupation Authorities (IOA) deprived 60 Jerusalemite children from returning to school this year, Jerusalemite Prisoners’ Families Committee said Thursday. 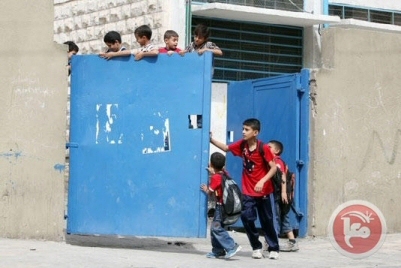 60 Jerusalemite school students, held in Megiddo, Hasharon, Ofek, and al-Maskoubiya detention centers, are deprived from returning to school as the new school year begins in Palestine, the committee clarified. Hundreds of Jerusalemite children were detained since the beginning of the year as part of the Israeli unfair measures against Jerusalemites, according to the statement. For the majority, their crime is resisting occupation’s practices. Most of the detainees were then released under tough conditions including house arrest, an Israeli measure that deprives dozens of children from their right for education provided by all international laws and conventions dealing with children’s rights, the statement reads. The Palestinian center for prisoners, for its part, said that 280 Palestinian minors are currently locked up in Israeli jails amid very difficult detention conditions. The minors, according to the center, are subjected to physical and psychological torture during their arrest and interrogation. Israeli torture methods include tying up detainees in painful positions for hours or days, depriving from sleep, strip search, isolation, and severe beating. Israeli soldiers kidnapped, Thursday, two Palestinian teenager girls, tenth grade students of the Al-Aqsa School, and also kidnapped two young men near the Al-Aqsa Mosque. Army also imposed more restrictions on the entry into the Al-Aqsa Mosque. Head of the Al-Aqsa School ‘Ehad Sabri said the soldiers kidnapped two tenth grade students, identified as Isra’ Ghazzawi and Bara’ Ghazzawi near the Chain Gate, after denying them access into the Al-Aqsa Mosque, and their Aqsa School. Sabri added that the police also denied many students and teachers entry into the Al-Aqsa Mosque through Bab Hatta, and forced them to use the Chain Gate. Sabri also said that, since the new school year began three days ago, the army started a series of violations to obstruct the educational process in the Al-Aqsa School, using various means, including preventing the students and teachers from entering Al-Aqsa through any other gate but the Chain Gate. Once the students make it to the Chain Gate, the soldiers and police try to hold them, and force them to wait for extended periods, while examining their ID cards or birth certificates. The Al-Aqsa Sharia School provides education to 120 young women, from the seventh through the tenth grade. Sabri said the Israeli restrictions are serious violations that target the educational process, and violate the students’ right to education, in addition to intimidating the students. It is worth mentioning that the soldiers also imposed a strict siege on the Al-Aqsa Mosque, for the third consecutive day, preventing most Palestinians from entering it while allowing Israeli fanatics to conduct provocative tours. The soldiers also installed iron roadblocks on the gates of the mosque, assaulted several Palestinians near the Chain Gate and the al-Majlis Gate, and kidnapped two young men identified as Khaled Hijazi and Ahmad Zghayyar. 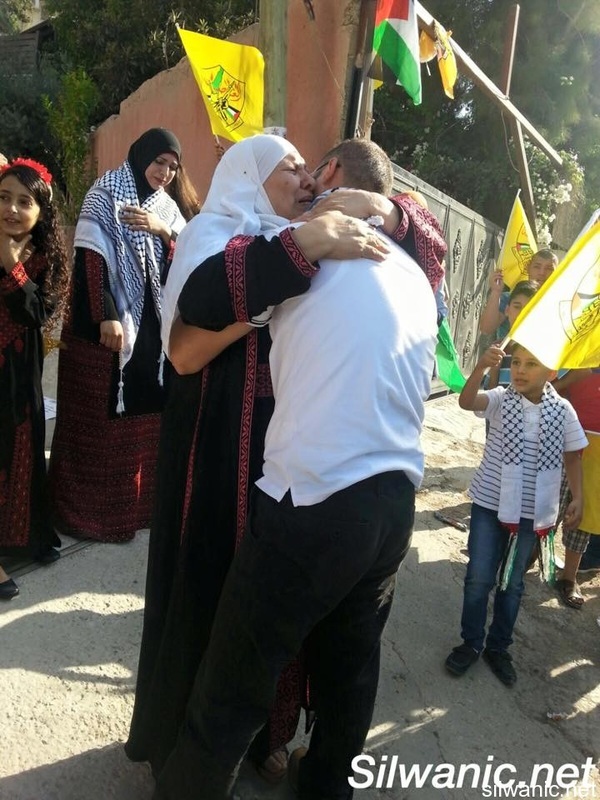 The administration of Rimon desert prison released on Wednesday the 36-year old Jerusalemite prisoner Khaled Majed Imam Shweiki from Wad Yasool in Silwan after he completed his 30-month prison sentence. Khaled was arrested on 27/2/2015 and spent 30 months in the occupation’s prisons. He was interrogated at Al-Maskobyeh cells and was transferred to Ashkelon prison and then to Rimon prison. On the other hand, Wadi Hilweh Information Center’s lawyer explained that the Magistrate judge decided to release Khalil Abed and Laith Abed Rabbo with a 300-NIS bail and a third-party bail of 5 thousand NIS for each. He added that sessions were held for Murad Alqam, Omar Tawil, Seif Tawil, Zeid Tawil and Omar Tawil to consider allowing them to go to school but the request was rejected. Al-Dameer organization lawyer, Mohammad Mahmoud, explained that the Magistrate judge extended the arrest of Mohammad Shallodi (18) until next Sunday and the prosecution submitted a prosecutor’s permit to submit an indictment against him. Sessions were also held for Mohammad Jaber, Mohammad Tayeh and Nour Abu Hadwan to also discuss allowing them to go to school but the request was rejected. Israeli police on Monday prevented the entry of school books into Islamic schools in al-Mosque. 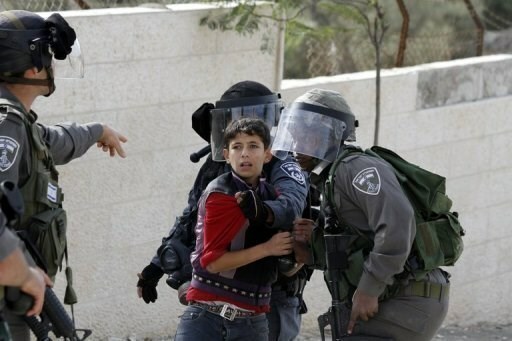 Three Jerusalemite minors were arrested. 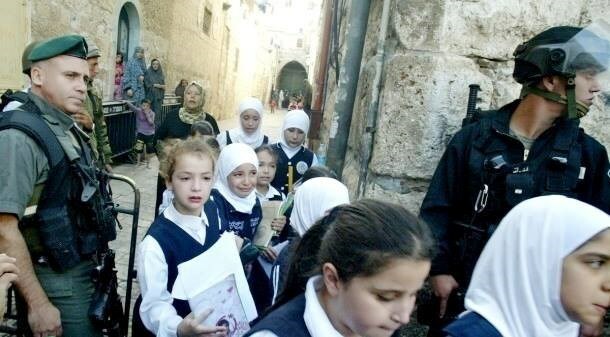 The Islamic Awqaf Department revealed that Israeli policemen barred the entry of school books into the Aqsa Mosque. It was planned to distribute books to students of Islamic schools in the Aqsa Mosque, particularly, Al-Aqsa Islamic School for Boys and Al-Aqsa Islamic School for Girls. 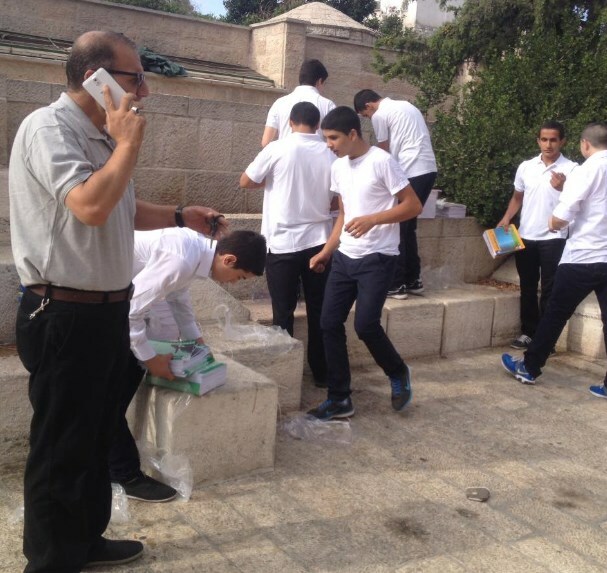 The department said that the management had to distribute books at the gates of the Aqsa Mosque. 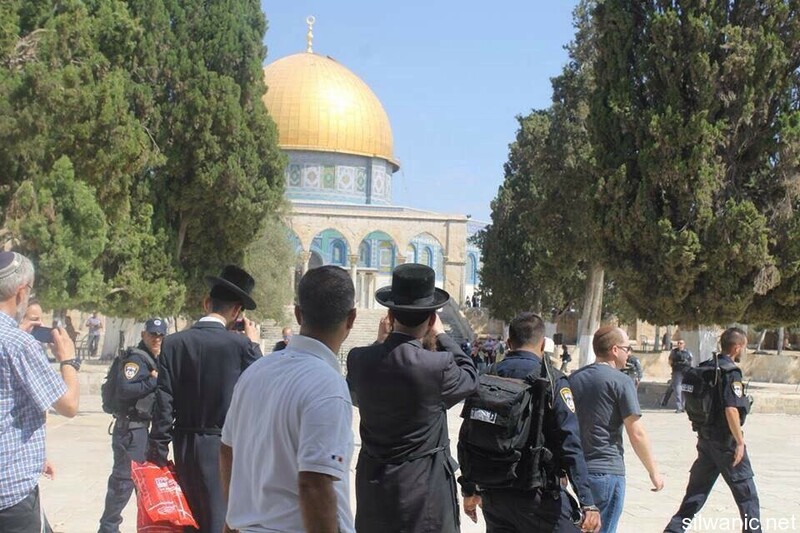 In a similar context, the Israeli policemen arrested three Jerusalemite minors at noon on Monday from the holy site. Media sources revealed that the minors were identified as Mahdi Abu Asab, Ahmad al-Salaymeh, and Adham Zaatari. They were taken to a nearby police station. On the other hand, the Jerusalemite woman, who was assaulted and arrested in the morning on Monday, has been released while another woman remained at custody. A state of high tension prevailed at the vicinity of the Aqsa Mosque due to barring Palestinian women, of different ages, from entering the Aqsa Mosque at 11 a.m. which is the time of settlers’ repeated incursion into the Mosque. Palestinian men, however, were allowed to enter the holy site on condition of submitting their IDs before entry. Around 225,000 Gazan schoolchildren were forced to return home, on Monday, after local staff at the UN agency for Palestinian refugees in Gaza (UNRWA) went on strike on the first day of the new school year. The strike comes amid a financial crisis in the agency that earlier threatened to delay the start of the school year. "We didn’t want to suspend classes, but the administration of UNRWA pushed us to take that step," secretary general of the union of UNRWA employees, Raafat Hamdouna, said. The union met with UNRWA Commissioner-General Pierre Krahenbuhl on Sunday and said the "atmosphere wasn’t positive." The union is protesting against overcrowding at UNRWA schools and unpaid vacations. At present, there are over 50 children in each classroom, with employees urging the agency to reduce the maximum capacity to 38. 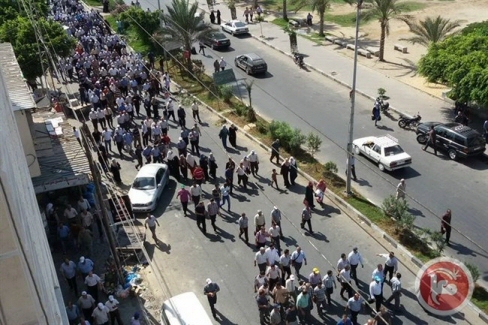 Hamdouna said union members will protest in five locations across Gaza, including a sit-in strike inside UNRWA's Gaza City headquarters to be attended by 13,000 employees. There are protests in the West Bank planned for Thursday, he added. For Palestinian refugees, the start of the school year came as a relief after UNRWA warned for weeks that it would have to delay the school year if it was unable to cover a $101 million deficit. The UN agency was only able to announce on Wednesday that the year would go ahead as scheduled, after it secured just short of $80 million in contributions against its deficit. UNRWA Commissioner-General Pierre Krahenbuhl affirmed the agency's commitment to its schools "because of how central education is to the identity and dignity of Palestine refugees." Around 1.2 million Palestinian children returned to school Monday for the start of the new school year in both Gaza and the West Bank, the Palestinian Ministry of Education said. Out of a population of 1.8 million in the Gaza Strip, some 1.26 million are refugees, according to UN figures. 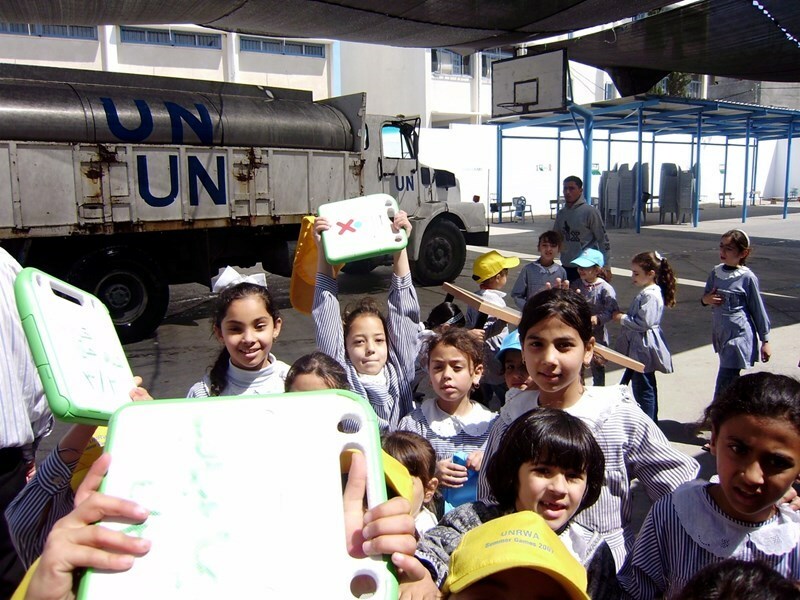 UNRWA oversees education for most children -- some 225,000 in 245 schools. Dozens of schools were damaged and affected by last summer's war between Palestinian militants and Israel. In the occupied West Bank, children returned to school amid tributes to the 18-month-old boy killed last month along with his father when their home was firebombed by suspected Jewish extremists. The school in Douma, the Palestinian village in the West Bank where the incident occurred, was renamed after the toddler, Ali Saad Dawabsha. The school year in the village was symbolically reopened by prime minister Rami Hamdallah. The boy's mother, Riham, taught at a school in a neighboring village. She remains in hospital with severe burns along with her other son, who is four. "The students are asking for any news about their teacher," Ahlam al-Masri, the principal of her school, told AFP. UNRWA General Commissioner Pierre Krenpol said Monday the agency backtracked on an earlier decision to give school teachers a compulsory leave of absence without pay. Pierre Krenpol said, in a press statement, the leave without pay was opted for as an alternative to work out the current financial crisis. 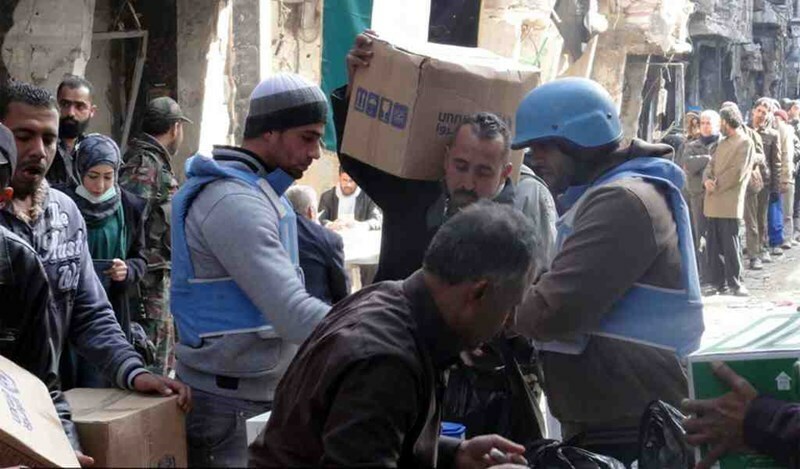 The UNRWA called on its recruited staff to never take any measures that might affect the agency’s potential to gather donations at such a critical time. The statement called for the need to boost the educational process in Palestine, particularly on the first day of the scholastic year, which started on Monday. 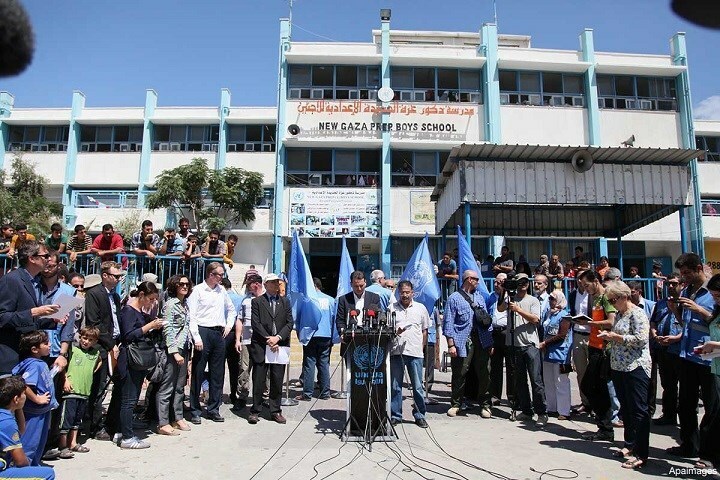 Earlier, the UNRWA employees union in Gaza announced their decision to strike at nine a.m. on Monday in protest at recent arbitrary decisions taken by the agency as regards the start of the school year and the financial crisis, among other concerns. Haaretz Israeli newspaper, on Wednesday, unveiled a plan for the Israeli municipality to a finance “long educational day” at high schools in East Jerusalem, in order to prevent the student demonstrations and throwing stones at the end of it. The newspaper said, according to the PNN, that the Israeli municipality and the Ministry of Education, in coordination with the Israeli police, decided to impose the long day on males only, by adding classes of computer studies, sciences, sports, arts and music, this in addition to the normal classes, to stall the educational day and exhaust students. The newspaper added that the police prepared this plan at the middle of the last school year, under claims that demonstrations and stones thrown at Israeli cars increased after the normal school day. The UN agency for Palestinian refugees said, Wednesday, that the school year for half a million Palestinian refugees would start on time, after an eleventh hour scramble to cover a $101 million deficit. UNRWA Commissioner-General Pierre Krahenbuhl said in a statement: "I am pleased to declare the 2015/16 UNRWA school year open." He said that the agency had been able to secure just short of $80 million in contributions against its $101 million deficit. He affirmed UNRWA's commitment to its schools, "because of how central education is to the identity and dignity of Palestine refugees and of the 500,000 boys and girls whose future depends on learning and developing skills in our 685 schools." "It is on the benches and behind the desks of UNRWA classrooms that millions of Palestine refugees, deprived for so long of a just and lasting solution, have built the capabilities and shaped the determination that enabled them to become actors of their own destinies." He added, according to Ma'an, that education was a fundamental right that never should have risked delay. 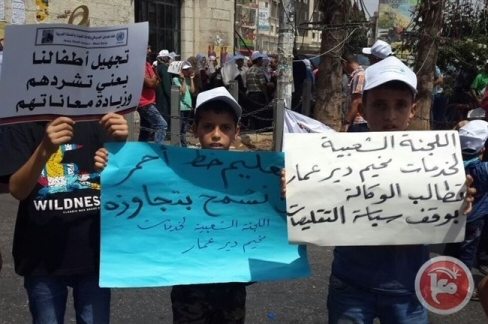 In recent weeks, Palestinian refugees across the occupied Palestinian territory have staged a number of demonstration to protest the UN agency cuts and the potential delay to the school year. 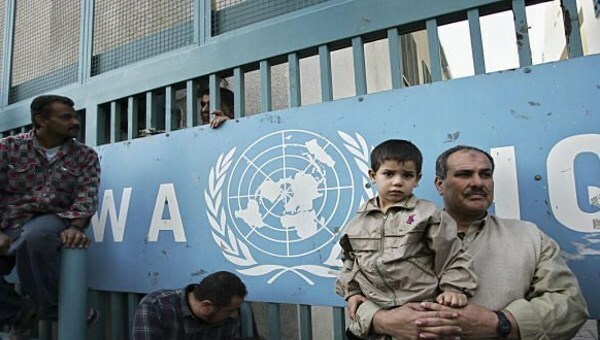 Krahenbuhl said that UNRWA had "heard the serious concerns expressed by host countries and the refugee community. The peaceful protests that took place over the past weeks showed solidarity and reminded the world of the importance of the work of UNRWA." Nearly half of the funding shortfall was covered by Saudi Arabia, Kuwait and the United Arab Emirates. 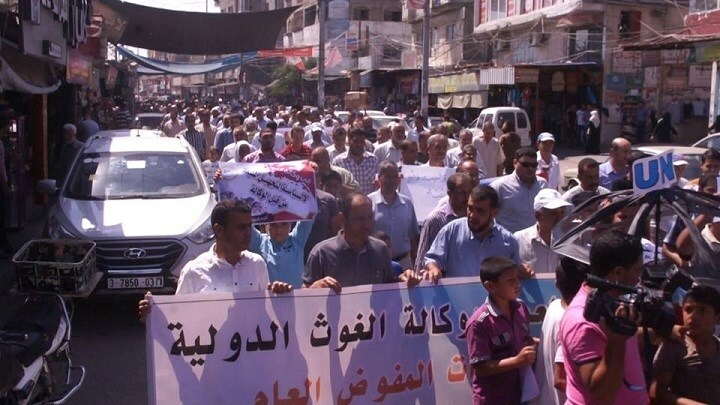 Hundreds of teachers, students and refugees on Saturday participated in a sit-in in Rafah area in protest at the UNRWA's decision to reduce services and postpone the start of the school year. The participants carried banners condemning the agency's decisions to reduce the services it provides for the Palestinian refugees and calling for giving the refugees their rights fully. During the protest, dean of the UNRWA Arab employees Suhail al-Hindi warned of a massive revolution by the Palestinian refugees in the face of the UNRWA's unjust decisions. Hindi stressed that the Palestinian refugees would never accept the suspension of the school year and would stand strongly in the face of all conspiracies that target them. He appealed to the Palestinian Authority presidency, the Palestine Liberation Organization and the national factions to assume their responsibilities and join forces to face the UNRWA's fait accompli policy. The Hamas Movement has warned that it will take tougher steps to force the UNRWA officials to backtrack on their decisions to reduce the services provided for the Palestinian refugees. Hamas official and lawmaker Mushir al-Masri described the UNRWA service cuts as an open war on the Palestinian refugees, warning that his Movement's reactions to the UNRWA's decisions would not remain limited. Masri called on the UN to shoulder its responsibilities towards the Palestinian refugees and move to cover the agency's budget deficit. He also demanded the UNRWA commissioner-general to halt all decisions that had affected the employees' rights before working on ending the budget deficit. The Hamas official stressed that the services provided by the UN for the Palestinian people are its duty because it had created the occupation on the land of Palestine. For his part, senior Hamas official Mohamed Abu Askar said in his speech in Jabaliya refugee camp that all options would be open to his Movement if the UNRWA persisted in reducing the services it provides for the refugees. Abu Askar emphasized that Hamas would never allow the UNRWA to close its schools and suspend thousands of teachers from their jobs as part of its measures to liquidate the issue of the Palestinian refugees. Saudi Arabia has announced that it will provide $35 million to the UN agency for Palestinian refugees in a bid to avert a financial crisis within the organization, a statement said. According to Ma'an, Yousef al-Bassam, Managing Director of the Saudi Fund for Development, said the donation aims to mitigate a funding crisis within UNRWA, which has threatened to delay the start of the school year for hundreds of thousands of Palestinian refugees. "The closure of schools for half a million Palestinian children would be a catastrophe. I hope the rest of UNRWA’s steadfast partners will take heart in the continued confidence placed in the agency by the Kingdom with this latest contribution, and step forward with their own pledges to keep UNRWA’s operations going,” al-Bassam said. The money will be spent on education and health in the Gaza Strip, upgrading schools and health centers in Jordan, and constructing three health centers in the occupied West Bank. Around $19 million will contribute to reducing the current financial deficit within UNRWA, estimated at some $101 million. UNRWA's Commisioner-General Pierre Krahenbuhl thanked Saudi Arabia for the donation, calling it a "strong message of solidarity" with Palestinian refugees. In May this year, UNRWA signed several agreements with the Saudi Fund for Development worth $111.5 million, bringing to $146.5 million the total of the SFD’s donations to UNRWA so far in 2015. Saudi Arabia is the third largest donor to UNRWA. Last week, UN Secretary General Ban Ki-moon raised alarm over a $100 million shortfall in funding for the UN aid agency for Palestinian refugees and called for urgent donations. He called "on all donors to urgently ensure that the $100 million required be contributed to UNRWA at the earliest possible date so that the children of Palestine can begin their 2015-2016 school year without delay." Palestinian premier Rami al-Hamdallah said that the financial crisis of the UNRWA would be resolved within days. In recent press remarks, Hamdallah stated that his government and president Mahmoud Abbas were lately in contact with the donor countries and achieved concrete progress with regard to the UNRWA's current crisis. He pointed out in particular to the efforts being made with the UNRWA to ensure the start of study in its school on a timely manner. The premier stressed the importance of containing and solving the UNRWA's crisis so as to protect the rights of the Palestinian refugees and support them in light of the difficult regional situation. Palestinians in a number of refugee camps across the occupied West Bank, on Tuesday, reportedly closed main roads near the camps to protest a possible decision by the UN agency for Palestinian refugees to delay the school year. Ahmad Abu Kheiran, the head of a popular committee in the southern West Bank's refugee camps, said that protesters used classroom chairs to block the roads. 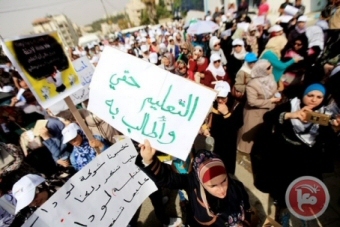 He said that the protest was the first of many that would be carried out against UNRWA. Abu Kheiran said that a possible delay to the school year, in addition to a wider reduction of UNRWA's services, was a dangerous step that could lead to terminating the UN agency entirely. Abu Kheiran made his comments a day after a Democratic Front for the Liberation of Palestine official in the Gaza Strip lambasted the UNRWA cuts. Mahmoud Khalaf claimed that "the alleged financial crisis in UNRWA" had been made up as a pretext to shut down the UN agency and undermine the Palestinian refugees' right of return to land inside Israel from which they were expelled in 1948. UNRWA was established in 1948 to provide relief to more than 700,000 Palestinians who were violently expelled from what became the state of Israel. After nearly 70 years -- with no solution to the Palestinian refugee problem -- the UN General Assembly has repeatedly renewed UNRWA's mandate every two years. The agency now attempts to provide basic needs to over five million Palestinians across the Middle East. In recent months the agency has been struggling to secure donor funding, forcing it to scale back on its core services, including education, in addition to its emergency relief programs. Last month, UNRWA said that unless funding was secured by the middle of August to cover a $101 million deficit, "the financial crisis may force the suspension of services relating to the Agency's education program." "This would mean a delay in the school year for half a million students attending some 700 schools and 8 vocational training centers across the Middle East." Earlier this month, UNRWA Commissioner-General Pierre Krahenbuhl said: "Nothing is more important for these children in terms of their dignity and identity than the education they receive. We are simply not allowed to let them down." Palestinian lawmaker Abdul-Rahman al-Jamal has expressed his belief that the financial deficit which the UNRWA claims to suffer from is a "fabricated crisis" aimed at undermining the issue of the Palestinian refugees. In press remarks on Wednesday, MP Jamal affirmed that the Palestinian Legislative Council (PLC) would not allow the UNRWA in any way to postpone the start of the school year and would take escalatory steps to prevent that. The lawmaker also denounced the UNRWA's decision to give its Palestinian employees special leave of absence without pay as an "illegal measure." He also warned that the PLC would move to confront all the arbitrary actions that had been taken recently by the UNRWA against the Palestinian refugees at the pretext of addressing its budget shortage. UN Secretary General Ban Ki-moon on Tuesday raised alarm over a $100 million shortfall in funding for the UN aid agency for Palestinian refugees and called for urgent donations. Ban said in a statement that the UNRWA relief agency was "a pillar of stability" for five million Palestinian refugees at a time when the Middle East is in the throes of crises and suffering. Ban has personally spoken to several world leaders in the past weeks about the unprecedented funding crisis at UNRWA, his spokesman said. The United Nations has been struggling to keep several humanitarian efforts afloat in the Middle East -- in Syria, Yemen and also Iraq -- where donors are under pressure to boost contributions. The war in Syria, now in its fifth year, has driven more than four million people to flee across the border to neighboring countries, in what the UN refugee agency UNHCR has described as the single largest exodus in a generation. 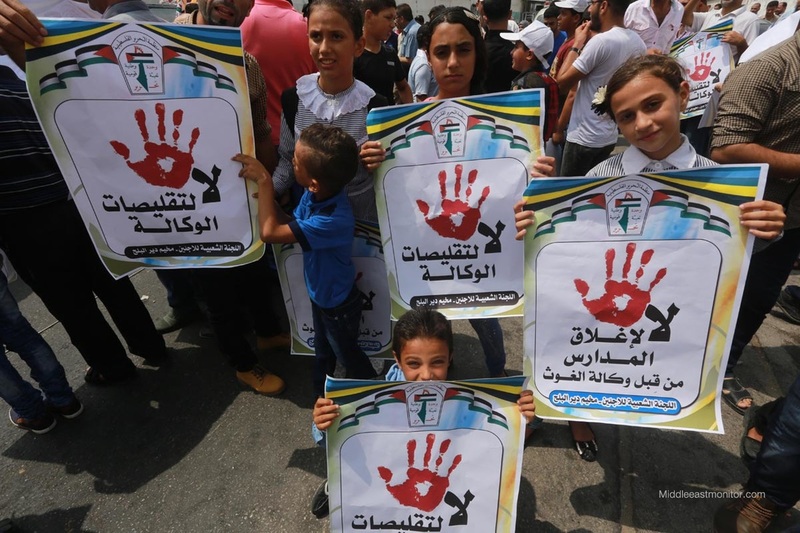 Palestinians in the Gaza Strip have staged demonstrations in recent weeks to protest UNRWA's reduction of services, and Hamas has accused the agency of "giving up its role" providing services to refugees. Around 80 percent of Gazans depend on foreign aid to meet their basic needs. 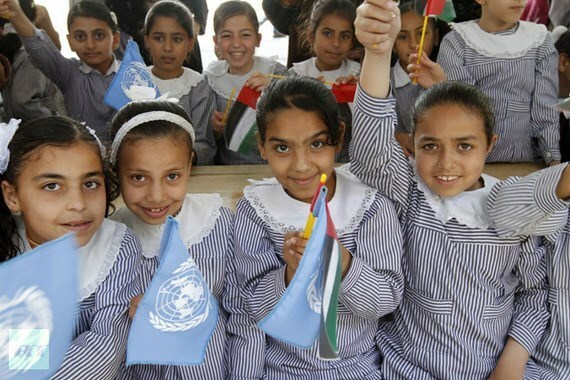 United Nations Relief and Work Agency for Palestinian Refugees (UNRWA) confirmed that it will announce its decision on the commencement of the Academic year in its schools and institutes in mid August. The agency revealed that it was facing a finical crisis making it unable to pay salaries for its employees. Deputy Commissioner-General of UNRWA Sandra Mitchel said, in a press conference on Monday, “No resolution has been made at the moment. I don’t think it might be made before mid of August. And, no one has the authority to make such a decision except for the Commissioner-General”. She said the UNRWA needs funding in order to run schools on time, stressing that UNRWA is keen to provide education services to half a million of Palestinian students. She revealed that there is a crisis in paying employees’ salaries of September, noting that August’s salaries will be paid as usual. She underlined that they are making the necessary efforts for obtaining required funding. Mitchel pointed out that the UNRWA has followed a series of austerity measures which led to ending the contracts of 85% of its employees. The UN Relief and Works Agency for Palestine Refugees (UNRWA) is suffering a severe financial crisis that has apparently forced it to cut costs, worrying Palestinian refugees in the Gaza Strip who depend to a large extent on the agency's assistance. On June 15, UN Commissioner-General Pierre Krähenbühl announced that the agency's fiscal deficit for the current year had reached $101 million, while adding that the UN remained committed to providing badly-needed services for Palestinian refugees. Marwa Obeid, 45, expressed fear that the crisis could affect the health sector and the distribution of aid to needy families in Gaza. She added that she and her friends had noticed a recent reduction in the health and educational services provided by UNRWA. "UNRWA had been distributing $20 in cash assistance for students at UNRWA schools in the Gaza Strip, which my children had benefited from," she said. "Recently, however, this has completely stopped, along with the daily meals provided to students, which ended after Israel's last war against Gaza [in mid-2014]," Obeid added. Aid provided by UNRWA, she said, was the "only reason" why her and her family were still alive, due to her husband's numerous health problems. In a statement to Anadolu Agency, Adnan Abo Hasna, the UNRWA's spokesman in the Gaza Strip, said the agency's current fiscal deficit may soon force it to close as many as 700 schools in the five areas that it operates in – namely, the Gaza Strip, the West Bank, Lebanon, Syria and Jordan, which collectively host some half million Palestinian children. "So far, there is no official decision to close any school," he said. "But the fiscal deficit may lead us not to open the schools and receive students next year." According to Abu Hasna, the UNRWA's 252 schools in the Gaza Strip – which offer services to about 248,000 Palestinian students – will face possible closure if the fiscal deficit isn't resolved. It also coincided, the agency added, "with the obvious decline of financial support from donor countries." Abdel Sattar Qassem, professor of political science at the West Bank's Birzeit University, meanwhile, believes the UNRWA crisis may be of a "political" nature. "The donors' failure to meet their commitments could be due to regional and international schemes aimed at reducing the agency's activities and terminating its services," he told Anadolu Agency. He added: "This would ultimately mean the end of the cause of the Palestinian refugees."